A couple of days before my flight to Japan, Beloved and I passed by Ali Mall to exchange some Yen. Unfortunately, we learned that the pawnshop that used to sell Yen no longer does it (I went to Sanry’s in Trinoma the next day; they offer very good rates). Anyway, hungry, we decided to eat in one of the new places in old Ali Mall, Sisig Society. Sisig Society specializes in sisig, or sizzling pig mask or ears, a Filipino dish often served as pulutan or beer match. This isn’t the first Sisig Society that I know of, but we haven’t tried yet the Eastwood branch. I have very high expectations of the place, as it’s facade in Eastwood was quite posh, giving it a high appeal despite serving a “commoner” dish. The place was still in soft opening, so a lot of the menu was still unavailable, to Beloved’s disappointment. She wanted to order their sinigang dish. We opted to order instead their Classic Sisig Meal (169 Php) and their Crispy Kare Kare (279 Php). Since only the sisig meal came with rice, we also ordered an extra cup of Plain Rice (30 Php). Our orders arrived pretty quickly, hinting that these were pre-prepared and just heated. 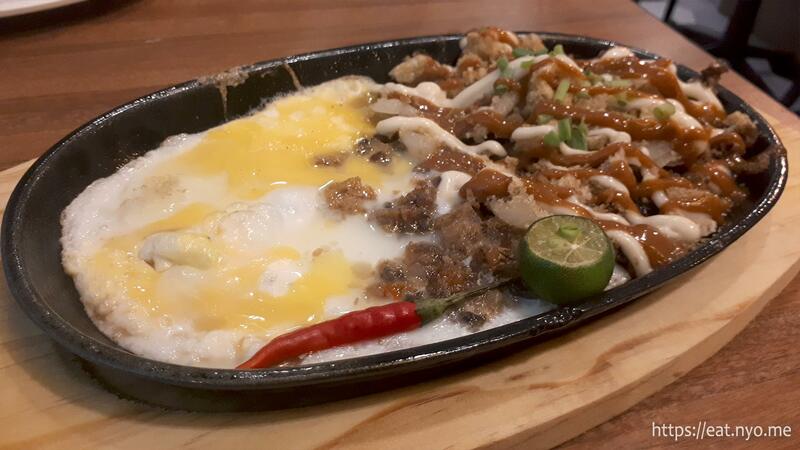 The Classic Sisig was served on a shallow plate covered in sauce and mayonnaise, only half-filled with the aforementioned pork bits and the other half covered in a couple of eggs. It only sizzled for a few moments, and, sadly, the hints proved tautology as the pork bits were quite makunat. The sauce had a barbecue-y taste to it and it wasn’t really as filling as we would’ve liked—this is only good for one. The Crispy Kare-Kare isn’t crispy and very tough, like crispy pork left out in the air for a few hours. 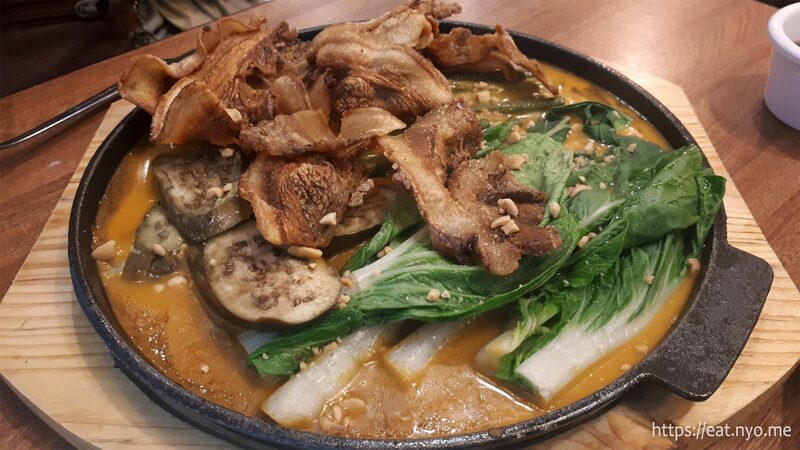 Also, the dish was served in a similarly shallow sizzling plate, which was not a good container for the kare-kare sauce. While taste-wise, it was okay, having the expected creamy-peanutty taste, more sauce would’ve been desired. Also, the included vegetables were cold; I was shaking my head in disappointment. Honestly, we’ve had better sisig experiences in the more “common” places, such as Rodic’s, Mang Jimmy’s, and even the carenderia I frequent near where I was working at years ago. I find it sacrilegious for sisig to be not sizzling crispy when served. Also, our other order also proved to be mediocre as well. For its price, even if you argue that it’s in a mall, you have better options nearby budget-wise. Heck, I’d go for the fast food offerings near the area. Maybe it’s because they were still in soft opening, but, at that time, I cannot recommend Ali Mall’s Sisig Society. Not recommended for: Smart gourmands. Smart nomnomnom tip: Wait for it to go out of soft opening.